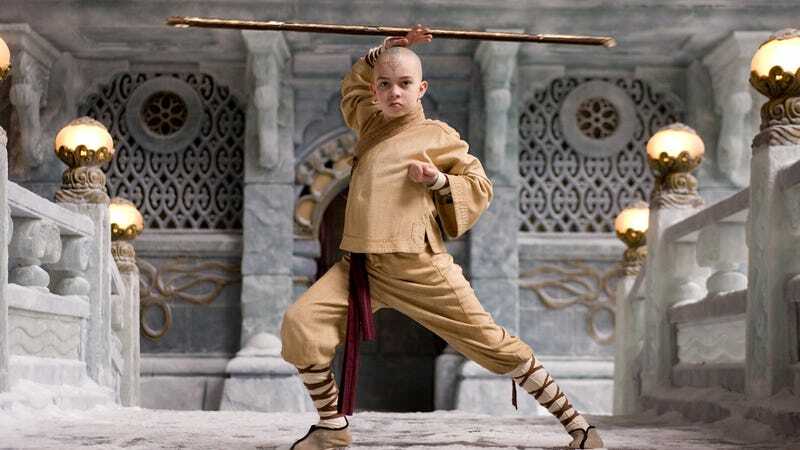 Noah Ringer as Aang in The Last Airbender. One of the things that made Nickelodeon’s Avatar: The Last Airbender so special was how well it told its story in just the right amount of time, using three seasons to take us through Aang’s journey. Well, turns out there were tentative plans for more—possibly with a redemption arc for Zuko’s sister, Azula. But the plan went out the window for that M. Night Shyamalan movie. Former Avatar head writer Aaron Ehasz shared a thread on Twitter—on April 1, though he insists it’s not an April Fool’s joke—about one of his bigger regrets in not continuing the Avatar saga on television. Mainly, he wanted more time with Azula, Zuko’s sister—who’d been brought to her lowest point in the series finale, after spending most of the show trying and failing to live up to their father’s impossible expectations. Azula’s story was expanded in the subsequent Avatar graphic novels, which explored her mental health issues and strained relationship with Zuko. She tried, but ultimately failed, to walk a new path—finding that disappearing from Zuko’s life was the best thing she could do, only to later show up and try to corrupt Zuko so he’d become a dictator like their father. For the TV series, Ehasz wrote that he’d intended for Azula to have a redemption arc of her own, with Zuko helping her through her pain just as Uncle Iroh had helped him. This would have taken place in a fourth season, which Ehasz said he’d “discussed” with showrunners Michael DiMartino and Bryan Konietzko. However, he wrote that any potential season four plans were scrapped after M. Night Shyamalan came onboard to direct the live-action The Last Airbender film for Nickelodeon. According to Ehasz, Shyamalan did support them doing a fourth season, but the showrunners wanted to focus on the live-action film (they were executive producers on the project). The rest is, as we saw, very awkward and whitewashed history—but only for the movie. DiMartino and Konietzko have since announced that they’re helming a live-action series adaptation of Avatar: The Last Airbender for Netflix. While it hasn’t been confirmed, it does look like the Netflix version will be a remake of the original series and not a sequel or continued story, like The Legend of Korra was. Ehasz, who’s currently helming The Dragon Prince for Netflix, does not look to be returning to this version of Avatar: The Last Airbender.